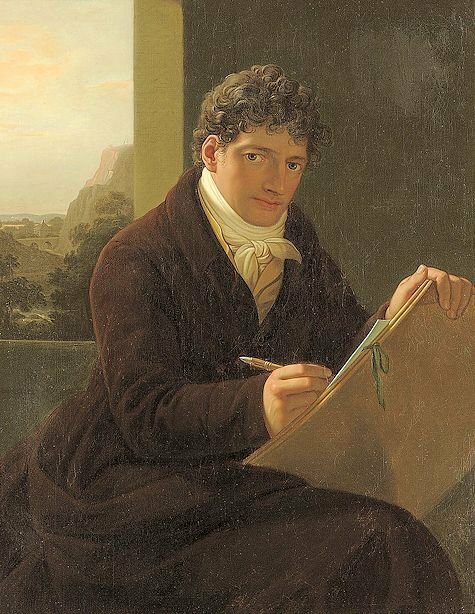 The Viennese painter Joseph Mathias Grassi (1757-1838) has recently entered the spotlight owing to a supposed miniature portrait of Mozart that has been attributed to him. Since there have been doubts and uncertainties regarding Joseph Grassi's correct middle name which is incorrectly given as "Maria" in a book, recently published by the Mozarteum in Salzburg, I take the opportunity to present a few primary sources pertaining to Grassi and his family. Although the basic genealogical facts regarding Grassi have been published 50 years ago by Heinz Schöny, art historians seem to have completely ignored this study. This resulted in a painter named Josef "Maria" Grassi entering the world of Wikiality. Ottilio Valentino Grassi had been born on 10 May 1723 in Udine, son of Valentino Grassi (1680-1762) and his wife Livia. 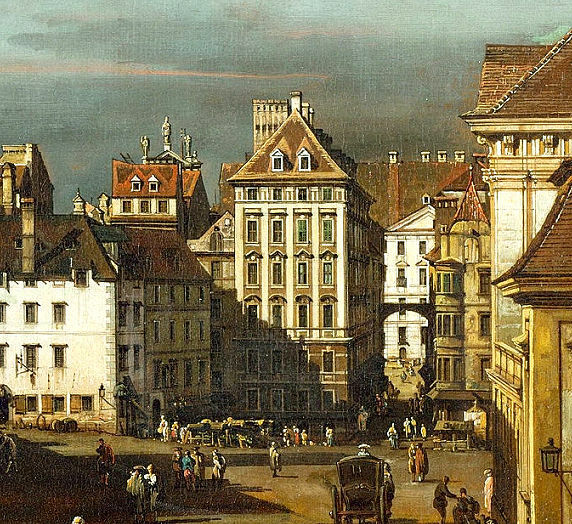 In 1742 Ottilio Grassi began his six-year apprenticeship in Vienna. In 1760 he was appointed master goldsmith and in 1761 he took the oath as "Wiener Bürger" (Viennese Citizen). Schöny gives Ottilio Grassi's date of death as "after 1782". 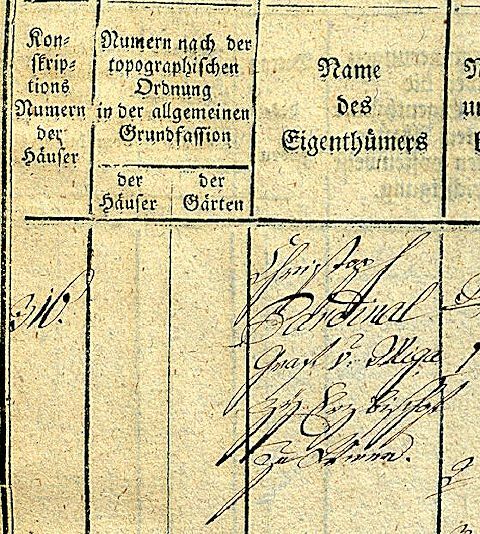 Grassi's appearance in the Steuerfassion (the municipal tax register) shows that he was still alive in 1788. 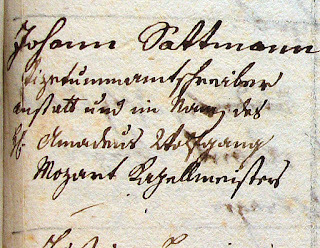 The 1757 baptismal entry of the painter Joseph Mathias Grassi (with his godfather misnamed "Winterhauer"). Note the f in "auf dem Hof" which looks like a double f, but is not (A-Ws, Tom. 34, fol. 334v). Consequently Ottilio Grassi's two daughters got their middle name from their maternal grandmother Margaretha Winterhalter, née Poser (1715-1775): Elisabetha Margaretha Grassi was born on 29 October 1759 and Eleonora Margaretha on 24 September 1761. The next child of the Grassi family was Johann Gottfried Grassi, born on 12 January 1766, who was named after his godfather, the K.K. 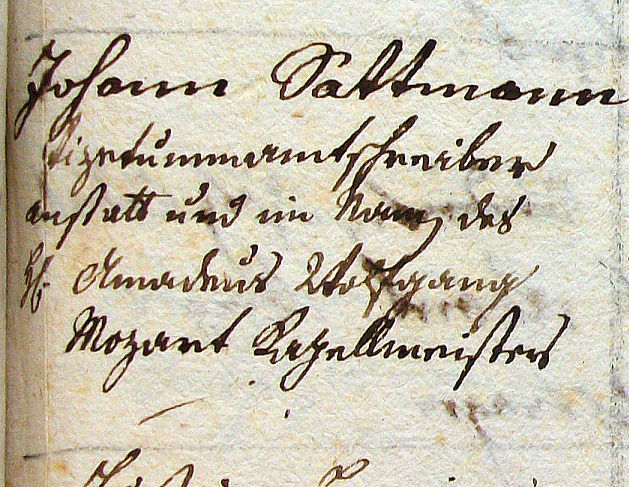 Hof Cammer Registraturs Adjunct Johann Gottfried Anhalt (who in 1754 had been Ottilio Grassi's best man). 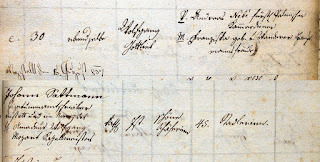 The last child of the Grassi family was born on 7 April 1769 and christened Johann Christoph after his godfather, the K.K. Hofkammer Concipist Christoph von Keßler. Keßler was a legendary freemason who in 1782 seems to have been responsible for Joseph and Anton Grassi joining the Viennese Masonic lodge "Zur Beständigkeit". 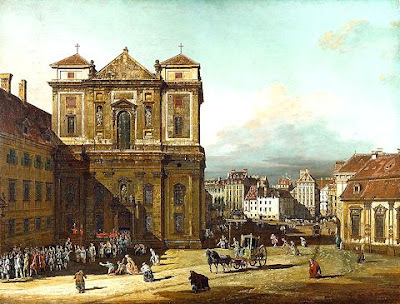 Ottilio Grassi died on 1 April 1791 in Vienna. 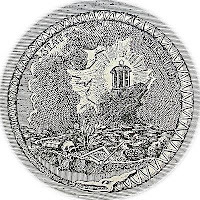 The seal of the Masonic lodge "Zur Beständigkeit" (which was disbanded in 1785) with its motto "STAT TIRMITER"
It seems that by leaving Vienna Grassi fared much better than most Austrian painters of his time. 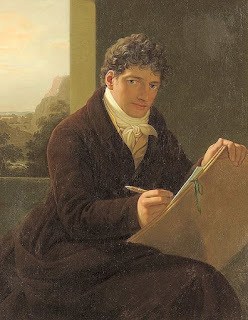 In addition to his income as a freelance portraitist by 1805 he already drew an annual income of 2,400 Thaler (that the Neuer Nekrolog der Deutschen in 1840 was to call "Westengeld") from Augustus, Duke of Saxe-Gotha-Altenburg whose poetry Grassi also used as subjects for a number of paintings. The villa in the Plauenscher Grund in Dresden that Grassi bought at that time was unfortunately destroyed in 1857. The "Gothaischer Geheimer Legations-Rath" Joseph Grassi, who after he had been awarded the title "Ritter des Königlich Sächsischen Civil-Verdienst-Ordens" always called himself "von Grassi", died a wealthy man on 7 January 1838 at his home at Moritzstraße 752 in Dresden. His grave on the Old Catholic Cemetery is not preserved. Since his work mostly consisted of miniature portraits of members of the nobility and other wealthy citizens most of his paintings are in private ownership today and can rarely be seen in exhibitions. This public underrepresentation of his artistic oeuvre seems to be the main reason that weak and technically flawed pieces of work, such as the *not really new* supposed Mozart portrait are being attributed to this great artist. The Mozart Discovery. Hitherto the small portrait on a tobacco box came with a huge question mark. Now it is certain: it shows a portrait if the composer Wolfgang Amadeus Mozart! In the course of a thorough study of all the documents and sources this portrait could definitely be identified as a Mozart portrait from 1783. The miniature shows a striking resemblance to the 1829 engraving by the Dresden engraver Gottschick, wh with this engraving refers to a miniature by Grassi. The portrait on the box could well be a work by Grassi, because Mozart and the painter met each other in Vienna. 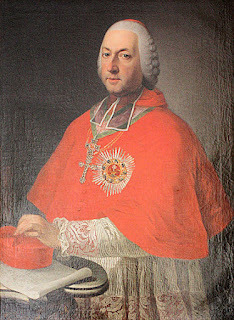 Joseph Maria[sic] Grassi (1757-1838)? 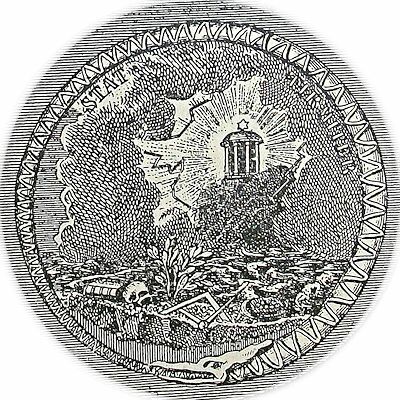 [sic] [...] The miniature shows a striking resemblance to the 1829 engraving by the Dresden engraver Gottschick who refers to a 1785 miniature by Grassi. The portrait on the box could[sic] well be a 1783 work by Grassi or done from a 1783 model, when Mozart and the painter met each other in Vienna. Possibly[sic] the object is identical with the "box lid that was done not long after his death, probably based on speculation" as the widow [Constanze Mozart] put it in 1800. It is conceivable[sic] that there were several Grassi miniatures of this portrait which looks unfamiliar to us today. There is no proof that this miniature was intended to show Mozart. There is no proof that it was done from life. The miniature is being attributed to Joseph Grassi in the book based only on a handwritten[!] note on a copy of Gottschick's 1829 engraving. This note has no provable connection to Gottschick who (for reasons not difficult to imagine) did not put this attribution on his engraving, but only wrote "Nach einem Miniaturgemälde 1785, gestochen von Gottschick 1829". From a purely technical point of view this portrait is starkly at odds with Grassi's work and does not fit into the corpus of his oeuvre. 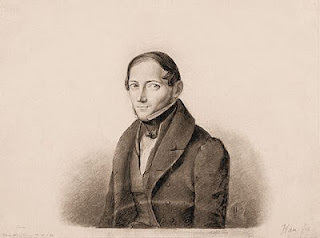 Dr. Großpietsch seems to have delved very lightly into Grassi's life, since he does not even know the painter's correct forenames and erroneously calls him "Joseph Maria" (while his name was Joseph Mathias). The dating of the portrait with the appearance of Grassi's name in a Mozart letter is totally arbitrary. There is no provable connection between Mozart and Grassi, apart from the fact that at a ball in 1783 both of them took part in a pantomime. None of the information presented by the Mozarteum on p. 96 of the book about the exhibition is new. The information simply copies research that has already been published in 2008 by Dr. Richard Bauer in his book "Das rekonstruierte Antlitz" (Neustadt an der Aisch: 2008). 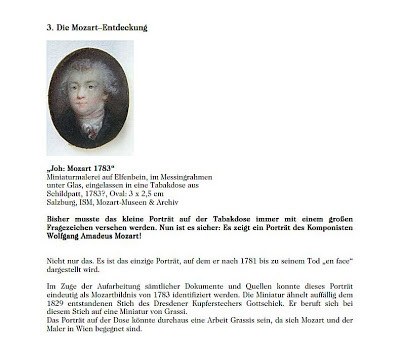 Bauer is not being given credit by the Mozarteum in connection with the miniature portrait in question. 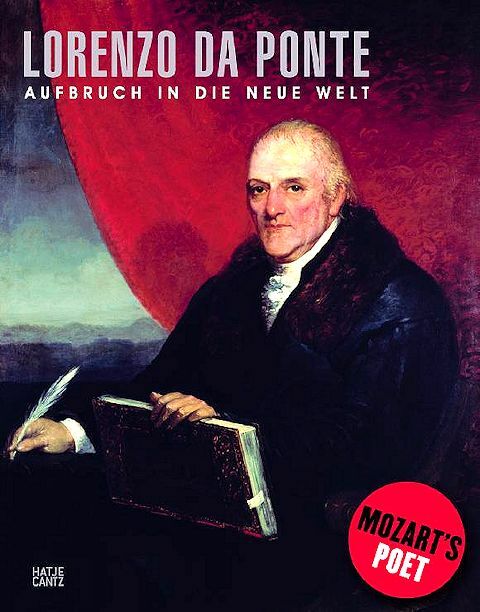 The articles in the book published by the Mozarteum are classic examples of the deep lack of logical thinking among scholars, who seem to be dazed by the "Salzburg Mozart Bubble" when it comes to logic and a clear methodology in defining *authenticity* in historical portraiture. I will deal with fundamental issues regarding the authenticity of Mozart portraits in an upcoming review of the exhibition book on this blog. The document said Mozart had owned the snuffbox for 10 years and gave it as a gift to Anton Grassi, a sculptor friend in Vienna. 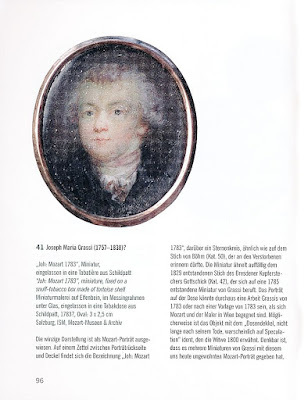 Letters from Mozart indicate that Grassi’s brother Joseph, also an artist, painted a miniature of Mozart. Joseph acquired the snuffbox from his brother and attached the miniature, Ms. Ramsauer said. One of the most famous portraits — and the one Mozart’s wife, Constanze, considered the most true to life — has long been considered unfinished. It is by Joseph Lange, Mozart’s brother-in-law, and shows him in profile, looking down, his face emerging from a dark background, with a triangle of torso surrounded by scratched white space. The painting, dating from 1789, without doubt looks unfinished, like a classical symphony of two movements. X-ray and infrared analysis performed at the Doerner Institute in Munich, an art research institution, last December showed that a small completed painting of Mozart’s head and shoulder had been trimmed and mounted at some point on a larger canvas, with paint added around the edges to smooth out the surface. The enlargement was unfinished, not the original. This paragraph offers no new information at all. It just repeats my 2009 discovery which I published on 19 September 2012 under the title "Joseph Lange's Mozart Portrait" on this blog. When I told Ms. Ramsauer about my discovery in June 2010, I learnt with astonishment that the thought of submitting the painting to X-ray and infrared analysis had never occurred to the Mozarteum curators. Only after my suggestion did they undertake said analysis, leading to the "sensational" results about which the Mozarteum is now bragging. Of course I do not quarrel with the fact that with this media announcement regarding the Lange portrait the staff of the Mozarteum is now claiming a priority that is not really theirs. There are so many colleagues who witnessed my discovery back in 2009 that today I can actually lean back and watch the ongoing (and partly embarrassing) events with great amusement. I am proud of my pioneering vision that needed no X-ray analysis to discover the truth about Lange's Mozart portrait already four years ago. The document that according to the 2013 article in the New York Times, "said Mozart had owned the snuffbox for ten years and gave it as a gift to Anton Grassi, a sculptor friend in Vienna" has still not been published by the Mozarteum. In 1787 Da Ponte is at the peak of his librettist career. And yet he is going to rise and take an even more important role in the world of theater. But before we reach that point in the exhibition, let us interject a question: Where did Da Ponte actually live in Vienna? 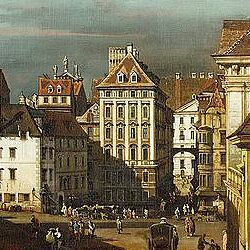 Contrary to Mozart, whose letters tell us about his numerous addresses during his Viennese years, and different from Da Ponte in New York, where he is documented as established businessman or teacher in many address books, none of the librettist's addresses in Vienna could hitherto be identified. Instead of keeping my apartment in the city, which cost me very dearly, I took a small chamber in the house of a tailor in the suburb of Wieden. 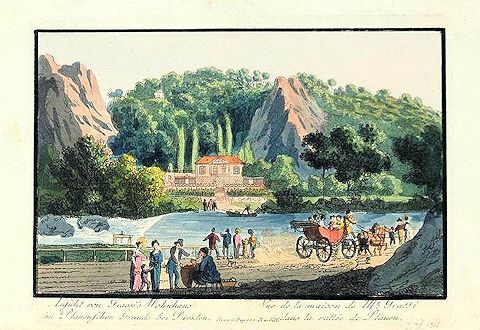 A clip from the 1829 edition of Da Ponte's Memorie describing his move to the sobborgo di Vidden. Salieri, who used to visit me every day, arrived at the usual hour to take me for a walk in a public garden. 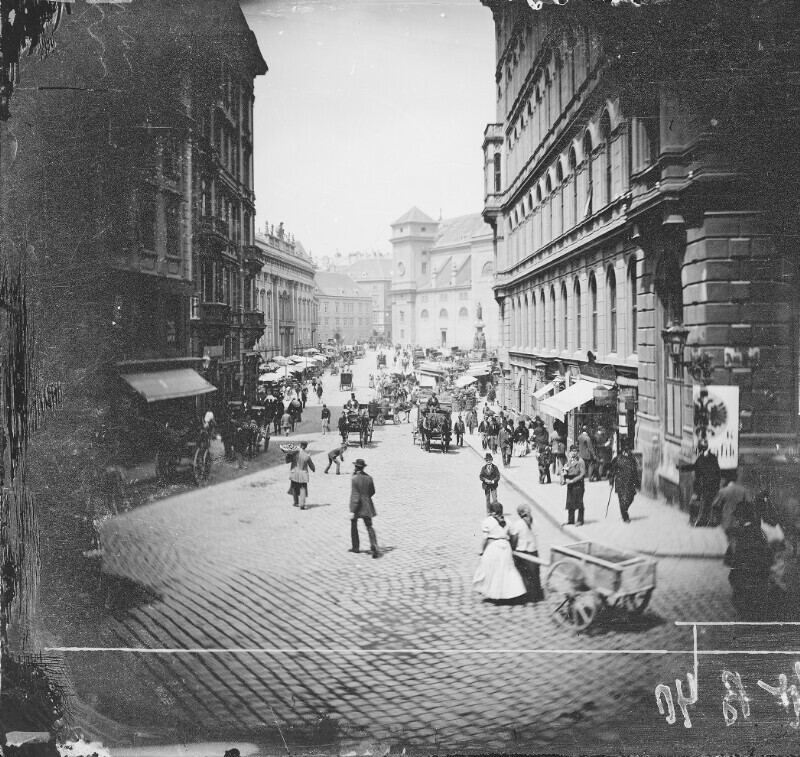 When I arrived at the Graben I noticed an old man in some distance, who was watching me attentively and didn't seem unfamiliar to me. Suddenly I saw him leaving his spot, he approached me, embraced me with great vivacity and exclaimed: "Da Ponte, dear Da Ponte, what joy to find you here!" And those were the very same words that he had said to me in my dream. 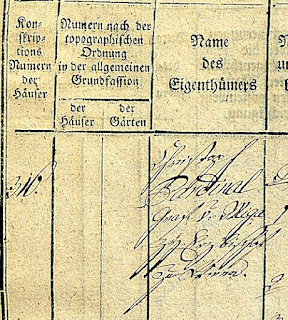 In September 2011, in the course of a complete reading of the 1787/88 Josephinische Steuerfassion, I was able to locate Da Ponte's name in these tax records (an inventory of all Viennese houses subjected to taxation, their main tenants and their leasing rates). It turns out that in 1788 Lorenzo Da Ponte lived in the "Heiligengeist Haus" ("Holy Ghost House") No. 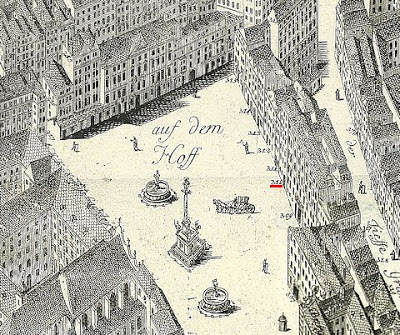 316, at the upper end of the Tiefer Graben, opposite the the so-called Heidenschuß, between the squares Am Hof and Freyung. There, for an annual rent of 200 Gulden, Da Ponte lived in an apartment on the fourth floor that consisted of three rooms, a kitchen and a firewood vault. 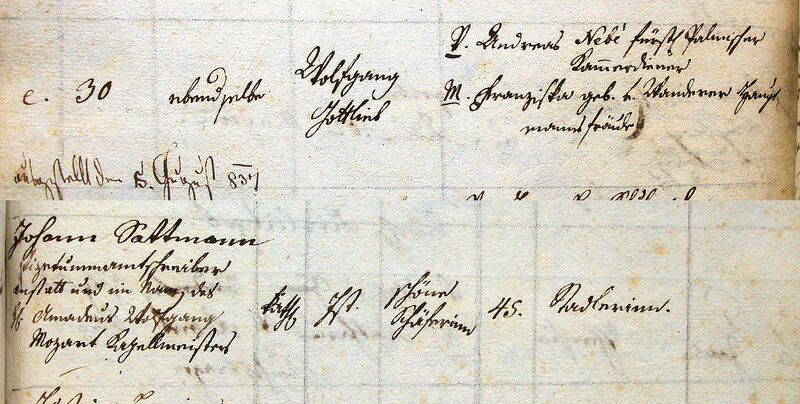 Unfortunately the bishopric's general ledger preserved in Vienna's Diözesanarchiv does not list the individual tenants and only gives a general summary of the house's annual rental yield (amounting to 3,431 fl in 1788/89). The name "Holy Ghost House" originated from a hospital foundation of the Order of the Holy Ghost which was established in Vienna on 27 May 1211 by Duke Leopold VI and his personal physician. The Holy Ghost Hospital proper, which was located on the Wieden, ran into hard times and was eventually destroyed by the Turks in 1529 during the Siege of Vienna. The last head of the Viennese branch of the Holy Ghost foundation, Dr. Jacob Nagl, went to great efforts to at least preserve the two houses in the city at the corner of Tiefer Graben and Heidenschuß for the foundation. For financial reasons the foundation had to be disbanded eventually and in 1579 the two houses were taken over by the bishop Johann Caspar Neubeck for the bishopric of Vienna. 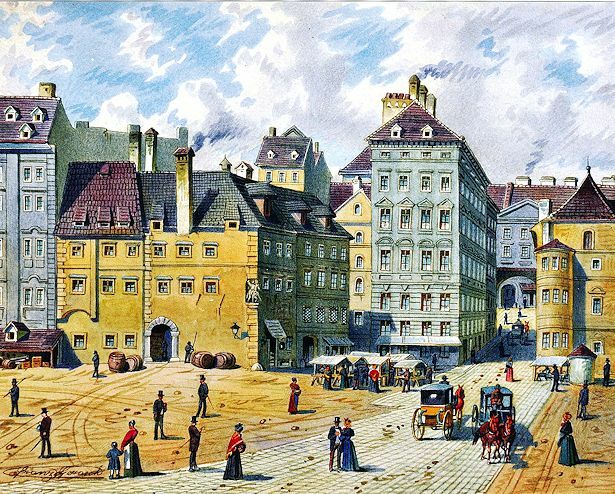 The two old small houses were torn down in 1639 and, for reasons of maximization of rental yield, replaced with one six-storeyed house whose broadsides faced the Heidenschuß and the Tiefer Graben. The entrance of the house was located on the southwest side and was decorated with a huge stone coat of arms of the house's builder Philipp Friedrich Count Breuner, similar to the one that today is on display near the main altar of St. Stephen's Cathedral. The "Holy Ghost House" seen from the Tiefer Graben. The entrance was located on the other side towards the Heidenschuß. In the foreground is a so-called Fleischbank, a cold storage house for meat (anonymous watercolor). Around the middle of the nineteenth century Franz Gerasch (1826-1906) painted a historistic view of the Freyung that also shows the "Heiligengeisthaus". It may have been inspired by Bellotto's painting. The most intriguing implication of Da Ponte's address is the fact that by living in the "Holy Ghost House" L'Abbe Da Ponte was a tenant of Vienna's archbishop Christoph Anton Cardinal Migazzi (1714-1803). Da Ponte is not the only person of musical interest connected with this house: at the time of his marriage in 1775, Antonio Salieri had been living there for several years and it seems possible that he later recommended this particular residence to his friend Da Ponte. Who else lived at Stadt 316 in 1788? 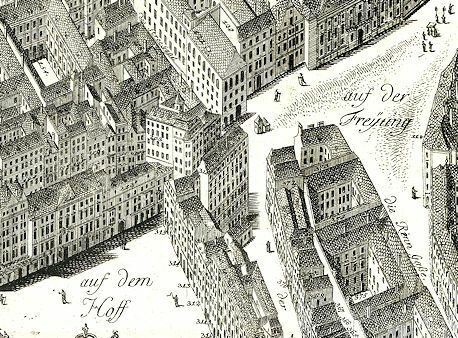 The first floor (in Vienna "Zu ebener Erde") housed a janitor's room, four butcheries, a wine tavern run by the bishopric and six Auslaggewölbe (shops). 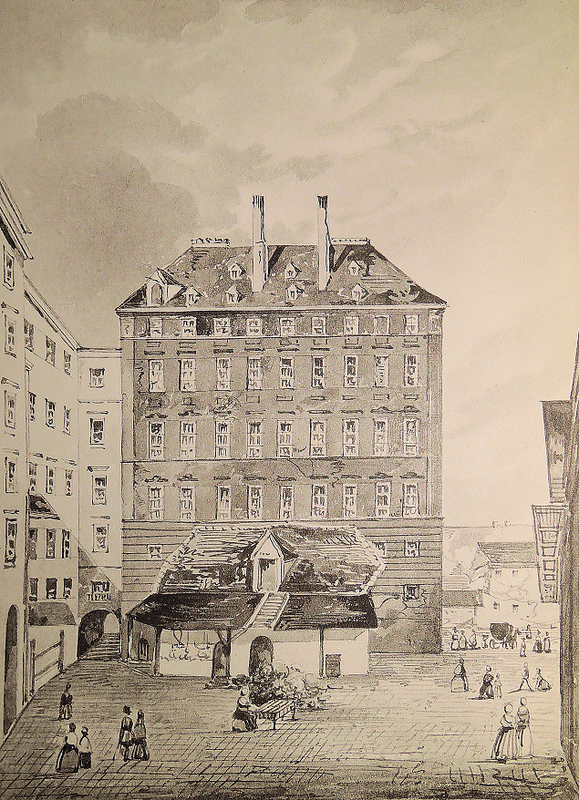 Among them Anton Angermayer's cheese dairy, Johann Michael Geiblinger's Greißlerei (a general store), and the butcheries of Nikolaus Paulus and Joseph Tscherny. The largest and most expensive apartment in the house (nine rooms on the third floor below Da Ponte) was let to the Tridentine capitular Count Wilhelm Triangi von und zu Latsch und Madernburg. The tenant who shared the fourth floor with Da Ponte was possibly Anton Brandt (1752-1822), the official of the Hungarian Court Chancellery, whose name appears in Matthias Raby von Raba und Mura's 1797 book Justizmord und Regierungsgreuel. 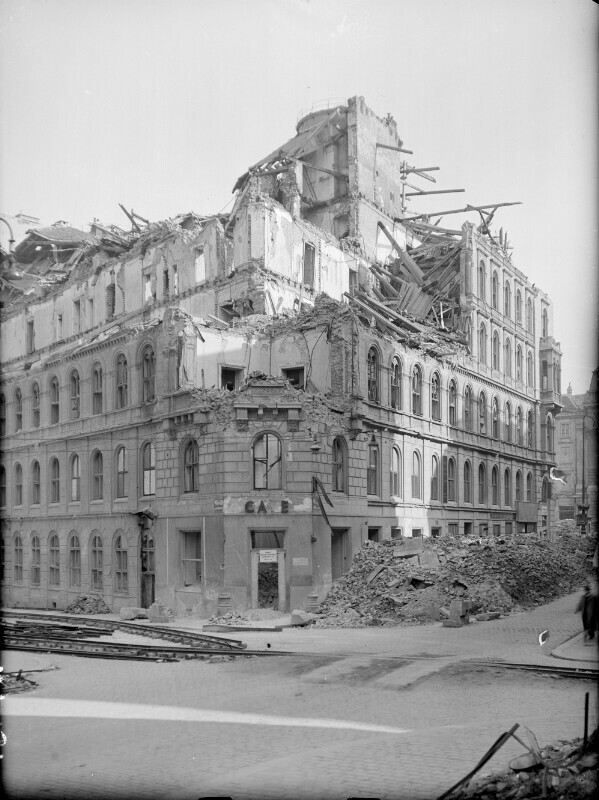 The fifth floor was leased to the wigmaker Paul Prem (the future father-in-law of the the clarinetist Joseph Bähr) and the Tyrolian Schwertfeger (swordsmith) Alois Walcher. On the highest floors lived Leopold Peidinger, the widow Ursula Kernhofer and the tailor Joachim Ruckhart, who had moved into the "Heiligengeist Haus" in 1769 after his marriage to Elisabeth Drescher, the daughter of a tailor who had also lived there. Of course the house was also inhabited by countless subtenants whose names do not appear in the tax records. It is not possible to determine when Da Ponte moved into the "Heiligengeist Haus" and whether he already moved out before going to Trieste in June 1791. Regarding Da Ponte's collaboration with Mozart it is important to note that the residence at the Heidenschuß was situated relatively close to Mozart's apartment on the Alsergrund where the composer lived at the very same time. This proximity may have been relevant in course of the preparation of the Vienna premiere of Don Giovanni on 7 May 1788. 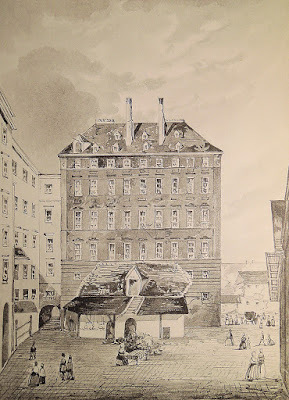 Mozart's next residence in the house "Zum Nikolaus" at Judenplatz 245 was also located relatively close to the Heidenschuß where Da Ponte may still have lived in 1789, when he and Mozart began working on Così fan tutte. In 1855 the bishopric sold the "Heiligengeist Haus" (by then No. 236) to the newly founded k.k. privilegierte Österreichische Creditanstalt which tore it down to make way for its new headquarters (to be destroyed during WWII). 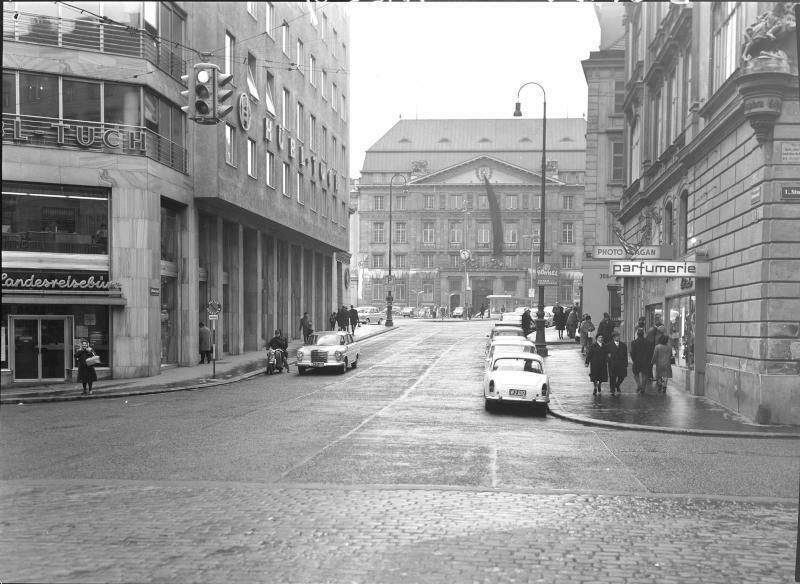 Most of the floor area of the historic building is located today on the street in front of Heidenschuss 2. The Freyung from the northwest in 2013. The Schottenkirche is on the left. This discovery was first published on 26 September 2011 in an amended footnote of my article "Mozart's Apartment on the Alsergrund" and again on 2 July 2012 in Wikipedia's Da Ponte article.